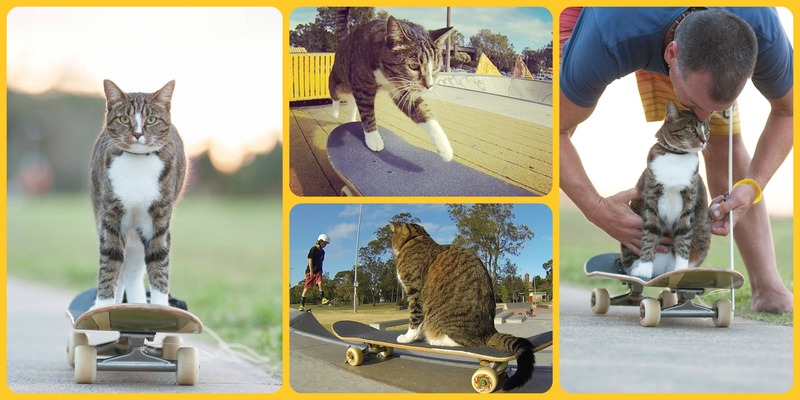 Didga, the Cat with Mad Skateboarding Skills! Behold the cat that loves to skateboard … and who does it well, I might add. Meet Didga, a two and a half year young clicker trained rescue cat who shows us that cats are not only clever, but they can “Drop In” with the best of them! Didga was rescued from a shelter at 13 weeks. At 2 and a half years young, Didga is teaching people everywhere what cats are capable of! She and her human, Robert Dollwet, want cat guardians to understand the value of responsible cat ownership by keeping their cats indoors, while showing people that they can teach their feline friends to walk on a leash, and other fun activities. This kind of positive, force-free training gives “the indoor cat experiences like those of an outdoor cat BUT without the dangers”. Check out Didga in her first Skateboarding video here! You can see more videos of Didga in action at her YouTube channel. The next time you think your cat can’t learn, come back and watch these videos of Didga in action. Robert Dollwet operates Malbu Dog Training in Australia. So adorable! Oops, maybe skaters don’t like to be adorable? Lol, what’s hip skater slang these days for awesome? The WikiHow link is hilarious! Isn’t it!? I laughed so hard!